We are dedicated to providing excellent service to meet the needs of local residents and businesses throughout the world﻿. Today the world is different , Shipping has become amazingly more easier. 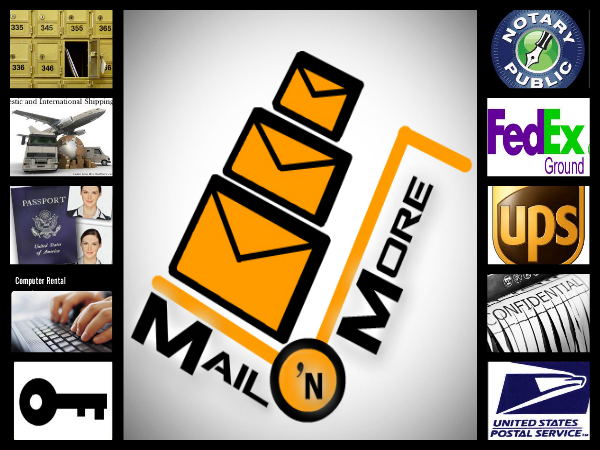 ﻿Over the years, Mail 'N More has learned the importance of providing services that go above and beyond shipping , packing and moving services. It offers many other services with others facilities. Mailboxes for Rent ( Full and True Street Address ), Notary Public Services,﻿Authorized FedEx, UPS, Daily FedEx and UPS pick-up at 5:00 pm , US Postal Services and Products ( Priority, Express, Certified Mail, Delivery Confirmation, Flat Rate, Media Mail, Stamps Custom Packing , artwork and more ), Packing Supplies ( We sell boxes, tape, bubble wrap, peanuts etc..), Shipping and Moving - door to door relocation services , Freight ,Ground, Air and Ocean , Business Services and Supplies,﻿Instant Passport Photo, Computer/Internet Rental, Fax sending and Recieving, Scanning, Copying, Rubber Stamps, Shredding Services, Printing Services- Business Cards, envelopes, letterheads and more Gift Items, cards and key duplication ..